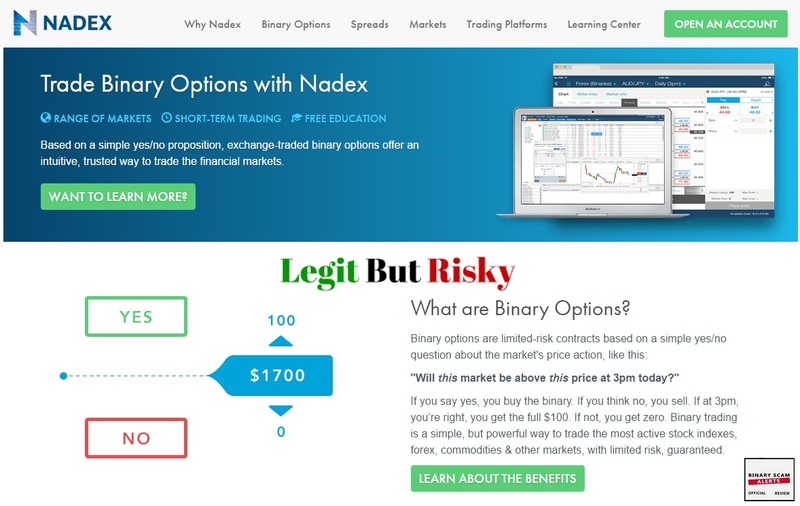 Binary Scam Alerts » Broker Reviews » NADEX Review, SCAM or Legit Exchange? Chicago, IL 60606 and their Chief Executive Officer is Timothy McDermott, and our members want to know if it is a legit and genuine software, or a blacklisted SCAM. Their US toll free number is: (877) 776-2339 and International one is: +1 312 884 0100. The Official Website is Nadex.com, which is also the login page and members area. Previously known as HedgeStreet, Nadex is an online peer-to-peer platform offering binary options, spreads, Forex, stocks, and commodities. John Nafeh was the original founder and creator of Nadex which was formed in 2004. It was purchased by the IG Group, which is a London-based firm and back in 1974 offered a new way to trade the price of Gold on the London Stock Exchange. Today NADEX, Chicago Board of Exchange (CBOE), and Cantor Exchange are the only regulated entities officially approved by the US Commodity Futures Trading Association to accept trades on binary options. 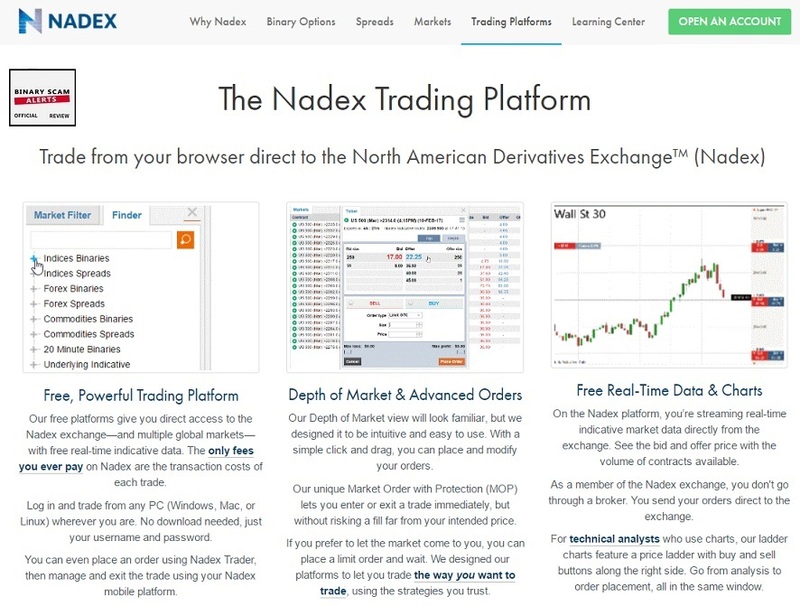 Nadex offers one of the most advanced and sophisticated trading platforms in the world of exotic options (AKA digital, or binary options) and derivatives. Their proprietary software allows traders to execute orders directly, without a broker. The platform is free, and includes real-time charting and data. as mentioned previously, this platform is one of only 3 regulated platforms available primarily for US traders, but also available for an international clientele. 1. You must have an opinion or idea of what will happen during a certain time frame in a given market. 2. Choose the asset you would be interested in trading (for example Gold or EUR/GBP). 3. Select a strike price and expiration. In other words, the time and price you wish to make a prediction for. For example, you can choose Silver for $5 at 14:00. 4. Select a direction. Meaning if you believe the contract will expire below the resistance line the you would chose the sell or put option, and if you believe it will expire above it then you would select the call or buy option. The max profit and loss are immediately displayed in the contract box. 5. The last step is to wait for the contract to expire or buyout early and pay a fee. Trading spreads means you are speculating on movements between two price levels. In essence you are looking at the price changes between two resistance lines and trying ascertain the direction. 1. You must choose a market (i.e Forex, Commodities). 2. Pick your position and price range (buy or sell and the amount you wish to risk). 3. Execute your trade to buy or sell. 4. Manage and close your spread trade. We recommend you don’t start placing trades on spreads since this is a completely different environment which requires a different knowledge base. There are affiliate promoting this software, and they are not unethical. They do however neglect to mention how hard it is to operate the software and the steep learning curve so don’t rush into this just yet. You can choose from a variety of assents which are divided into “markets”. You have Forex, Stock Indices, Commodities, and Events which are considered extremely speculative and in many cases equated to gambling. The environment is not as one would expect and does not resemble the usual more simple trading formats. You do have a demo mode, and it is highly recommended you use it to familiarize yourself with the software. On the left you can see how the “Finder” feature works. You have the various assets you can choose from, so you open the drop down menu and select the contract type and expiry time. It’s worth noting that the software supports PC (Windows, Mac, or Linux). We also found it to be mobile friendly (responsive) and there is also a mobile app. You simply search your smart phone, for “Nadex Binary Options” and the first option that will pop up is the one you will need to install. The app is available on IOS as well as on Google Play (Android) cellphones, tablets. iPhones, and most iPads. It’s also interesting to see that there are additional assets such as Russell 2000, and Soybeans you will not see on the usual Market Maker broker. This adds an interesting twist and a breath of fresh air in the form of access which is usually not granted to day traders. On the left you will see the ticket box and how it works. In essence you have an offer type, and a bid. You buy or sell the contract based on what you perceive the outcome will be, and once the order expires you can see if you made money or lost your investment. It’s worth noting that it is possible and also recommended to start out with smaller amounts and test the waters. There are also new terms like depth, and limit GTC which you will encounter. Generally speaking it is recommended to start out with the smallest size (1) and then proceed. Based on the amount you choose you will also immediately see the amount of money which you have risked. If this is all Chinese to you then you had better dig in deep into the learning center which is packed full of webinars, FAQ’s, videos, handbooks, and trading tutorials. If you want additional information feel free to contact us and we shall be more than happy to point you in the right direction, but anyone can see this is not a “send and forget” hands-off solution. You need to understand exactly what you are doing in order to achieve success with Nadex. Trading fees per contract stand at $1 and capped at $50. If you trade 51 contracts or above, you will not be charged additional fees. If your contract expires in the money, Nadex charges a $1 contract fee, however nothing is charged if you lose your money. Additional fees include withdrawals and returned deposits. For deposits of $500 or over on your initial deposit your fees will be waived. There are no bonuses as you would receive with your usual broker. The benefits are there if you can actually master the software and understand how to use it. There’s no way this broker will rip you off, and you will always get paid promptly. It’s pretty obvious to see that this is not a push money scam offer. However, if you start trading with Nadex and have no prior experience, you had best get ready to sit down and start learning the material because there’s absolutely no possible way for you to succeed if you don’t understand how to maneuver your way inside the system and identify the right opportunities. As opposed to other brokers, there is no conflict of interest as this is a peer-to-peer solution which only provides the trading arena and charges a fixed fee per contract. Sure is! This is not an automated trading robot and you will need to educate yourself if you wish to succeed. There is a significant amount of knowledge which is needed, and if you fail to learn how the charts and systems work you will surely lose your money. Can I Make Money With Nadex? Again, the short answer is yes, however if it was that easy everyone would be rich right? This is not a get-rich-quick scheme, and don’t expect to become a millionaire over night. This is the real thing, but if you are not careful then you will surely end up losing money instead of profiting. Nadex is most definitely NOT a scam, and we can say this with absolutely 100% certainty. It is however a platform for trading exotic options and derivatives, and these financial instruments carry a huge amount of risk which leads us to our next section and that what are every-day people saying about it? From the comments and we received it was fairly plain to see that most people ended up losing their money. Again, this is based on what our members say, so please try to understand that there is a broad spectrum of traders executing trades and many of them are experienced and know how to read charts and manage risks. So based on OUR feedback, we would have to say that it is an adventure we would NOT recommend you attempt to endeavor unless you view your trading with Nadex as a form of online trading education and not a way to actually achieve financial freedom. If you are not really sure about Nadex and want a tried and tested signals solution or trading robot, please make sure to check out our recommended section. Our staff of researchers has compiled a short yet reputable list of consistent money-making machines which have endured the test of time. Review Summary and Conclusions – Scam or Legit? After carefully examining this software our researchers have reached the conclusions the Nadex is NOT a scam, however if you are not an experienced trader chances are you will end up losing your money. So yes, it is a genuine app however as much as they try to educate you there’s no way you will be able to grasp the full scope of the software and how to master the various charts and tools they offer in a reasonable amount of time (again, there are exceptions). So, at the end of the day what you are left with is a legit software that loses you money because its too complicated to use. 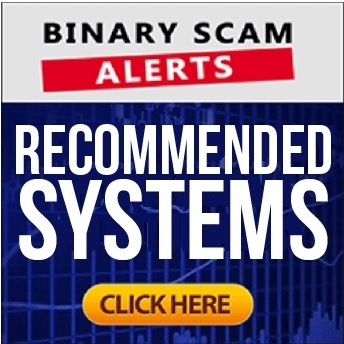 Due to the facts we have collected we have decided NOT to blacklist this software, but at the same time advise our members to use simpler systems unless they are willing to invest a lot of time learning how to use the software. For more information related to brokers, auto-traders, and signals please join our Facebook page and Subscribe to our YouTube Channel.